While you are an active notary public you may be asked to perform a variety of notarial duties. One of the most common types of transactions are acknowledgment notarizations. When performing an acknowledgment, the notary public must verify the identity of the signer and confirm their signature is the one that appears on the document. The document does not have to be signed before the notary. Many states do require a certain verbiage or wording to be the document once the transaction has taken place. If the text is not pre-printed on the document you may need to write it out which can be very time consuming. That is why we have created the Self Inking Notary Acknowledgment stamp. 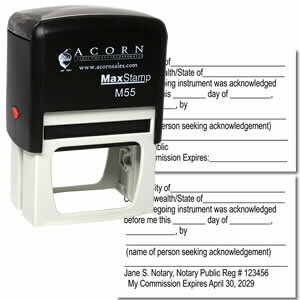 This self inking stamp is designed to assist all notaries and is simple to use and maintain. Unsure if this is the correct product for you? Contact us! The Self Inking Notary Acknowledgment stamp is a time-saving tool for all notaries. The Self Inking Notary Acknowledgment stamp is a durable stamp that can be used up to 5,000 times before needing to be re-inked. When it is time to re-ink the Self Inking Notary Acknowledgment stamp, simply push the replaceable ink pad out and squeeze a few drops of ink on to it. Once you have pushed the ink pad back in to the stamp you are good to go! This simple and extremely useful stamp will turn heads in the office as well as impress your clients. You will always be prepared with the Self Inking Notary Acknowledgment stamp!